Inside her dogged fight against the debilitating disease. Dr. Reisa Sperling leads the Center for Alzheimer’s Research and Treatment at Brigham and Women’s Hospital in Boston. REISA SPERLING, ONE OF THE WORLD’S foremost researchers of Alzheimer’s disease, was vacationing at Lake Tahoe with her family in 2008 when she noticed her father was behaving strangely. At first, Sperling thought her dad, a 74-year-old chemistry professor, might simply be tired. Perhaps the altitude had affected him. And then she had a terrible thought: He was acting just like her grandfather — his own father — who had died of Alzheimer’s in 1993. Yet a subsequent evaluation with his primary care doctor yielded a clean bill of health. The symptoms of forgetfulness seemed to dissipate. Sperling figured that, given her line of work, she had been overly vigilant. She did her best to quell those worries about her father. About a year after the trip, she got interested in research that focused on a phase of Alzheimer’s that doctors knew little about: the preclinical phase. People in this stage still function normally, but unbeknownst to them, they already have buildup of a protein called amyloid — one of the two hallmark features of the disease — in their brains. (Alzheimer’s also involves abnormal tangles of another protein, tau, which emerge somewhat later in the disease process.) For the past 25 years, research has pivoted around the so-called amyloid hypothesis, which maintains that the buildup of amyloid plaques is the primary trigger for the mental deterioration wrought by the disease. The preclinical phase, which can be identified by PET scans, typically lasts 10 or 15 years before significant memory problems set in. The sprightly Sperling, who is also a professor of neurology at Harvard, has followed an unconventional career path. After high school, she spent seven years touring the country as an actress in musicals. Her singer and dancer side is still in evidence: She exudes an infectious optimism even while teasing out the intricacies of this frightening disease. For Sperling, a preoccupation with the inner workings of the brain is a family affair. She is married to Keith Johnson, a professor of radiology at Harvard Medical School and Massachusetts General Hospital. The couple collaborates on the Harvard Aging Brain Study, which uses brain imaging to track the buildup of amyloid in healthy adults. “Our kids made a rule that we couldn’t talk about brain science for the first 20 minutes of dinner,” she says. But both of their daughters are showing interest in the family profession. Sperling’s elder daughter recently landed a job at a neuroscience lab at Columbia University. And her younger daughter, who just finished high school, has made noises about studying medicine. In 2011, Sperling was the lead author of a groundbreaking paper that proved the tell-tale signs of Alzheimer’s could be diagnosed long before patients begin to exhibit symptoms. And in a follow-up paper published this spring, co-written with about two dozen of the world’s leading Alzheimer’s researchers, Sperling proposed using the preclinical phase to change the very definition of the disease, arguing that it should now be based solely on the presence of amyloid and tau. “Little did I then know that I was also watching it happen in my own family,” she says. For the next few years after that worrisome vacation, her father continued to go to work every day. But in 2013, Sperling was at her parents’ home in Pennsylvania for Thanksgiving when she made an upsetting discovery in her father’s office. Piled all over the floor were dozens of sardine cans, some already opened. In early 2014, cognitive testing by a neurologist at the University of Pennsylvania confirmed Sperling’s assessment. Her father’s decline was swift, and Leslie Sperling died of Alzheimer’s in 2016. Reisa Sperling has channeled the frustration and despair that she felt from her inability to help her father into her life’s work. She is now obsessed with figuring out ways to intervene in the early stages of Alzheimer’s. She also wants to ensure that doctors will soon have a wider array of tools at their disposal to fight back against the unforgiving disease. Last December, Sperling, along with her longtime colleague Paul Aisen of the University of Southern California, and Ronald Petersen of the Mayo Clinic, landed a $70 million, five-year grant from the National Institute on Aging. Their work aims to bring Alzheimer’s research into the 21st century. The grant, which is partly modeled after a clinical trials network established by the National Cancer Institute, will build a research infrastructure called the Alzheimer’s Clinical Trials Consortium, a network of 35 testing sites at academic medical centers across the country. When starting a clinical trial, researchers often have to build everything from scratch. But these sites will be teed up and ready to go, says Petersen, who directs the Mayo Clinic Alzheimer’s Disease Research Center. The clinical trials consortium will allow researchers to share data, blood samples, and outcome measures, and help them to recruit and retain participants. “This should be a game changer,” says Laurie Ryan, who leads research on the dementias of aging in the Division of Neuroscience at the National Institute on Aging. By making it much easier for scientists to launch all manner of studies, Sperling and her colleagues aim to eradicate Alzheimer’s within a generation. If they succeed, Sperling says, the disease could virtually vanish just as polio did in the mid-20th century. RESEARCH ON ALZHEIMER’S, which accounts for 60 to 80 percent of all cases of dementia, urgently needs a reboot. More than a century after the disease was first identified by the German psychiatrist Alois Alzheimer, its ultimate cause remains elusive. Most experts agree that Alzheimer’s arises from a complex interplay between genetic and environmental risk factors. (Only about 1 percent of all cases are purely genetic.) The disease currently affects 5.7 million Americans, and the cost of caring for all of these patients amounts to nearly $300 billion a year. Over the past half-century, Alzheimer’s researchers have faced a series of daunting challenges to devising effective treatments. The first problem is that doctors have long made the diagnosis solely on the basis of behavioral symptoms. As a result, they could never be entirely sure if the patient’s memory problems were due to Alzheimer’s or some other brain disease. Second, the buildup of amyloid does not invariably lead to Alzheimer’s. Autopsies have shown that a small but sizable segment of individuals with large amounts of amyloid in their brains still function normally throughout their lives, even when they die at an advanced age. Third, drugs have typically been tested in patients already plagued by memory problems, but their brains may already be too damaged for any intervention to work. Reisa Sperling on a fishing expedition with her father, Leslie Sperling, who died in 2016. Sperling’s dogged determination is much needed in a field that is smarting from a series of major setbacks. The last new drug was approved 15 years ago, and none of the drugs that are currently available can alter the course of the disease. The clinical trials needed to get FDA approval cost over a billion dollars, and the last 12 have all been devastating flops. The latest failure occurred in mid-May, when Johnson & Johnson was forced to abandon its Phase 2 trial of an anti-amyloid drug that proved to be toxic to the liver. Sperling was the principal investigator and had designed the study, which was testing healthy adults over 60 with high amounts of amyloid in 16 countries. Just about every major drug company has been hit hard. Consider the recent tribulations of Eli Lilly, Pfizer, and Merck, which all placed heavy bets on highly touted anti-amyloid drugs that were supposed to slow cognitive decline in patients with Alzheimer’s. In late 2016, on the day that Lilly announced the dismal results of its Phase 3 trial of a drug called solanezumab, its stock dropped more than 10 percent. A few months later, the company laid off the 500 employees who were working exclusively on the project. In January, Pfizer, which gave up on a drug after a disastrous Phase 3 trial several years ago, announced that it was closing its neuroscience division. This move meant shutting down eight Phase 1 and Phase 2 trials studying Parkinson’s and Alzheimer’s and resulted in the loss of 300 jobs in New England. And in February, when Merck pulled the plug on its Phase 3 trial for another drug, its stock didn’t even go down because, as drug industry analysts noted, many investors now dismiss anti-amyloid drugs as a lost cause. A small but steadily growing contingent of neuroscientists believe the amyloid hypothesis is ready for the scrap heap. But Sperling isn’t ready to give up on anti-amyloid drugs. And neither is Biogen, which is forging ahead with a Phase 3 trial involving more than 3,000 patients in 20 countries for its anti-amyloid drug. According to Haeberlein, other failed anti-amyloid trials attempted to help patients who already suffered from clinical symptoms and whose brain damage was not reversible. “We are intervening earlier, when patients are just beginning to have memory problems,” she says. Sperling thinks early intervention may soon emerge as the treatment of choice for a huge swath of patients. 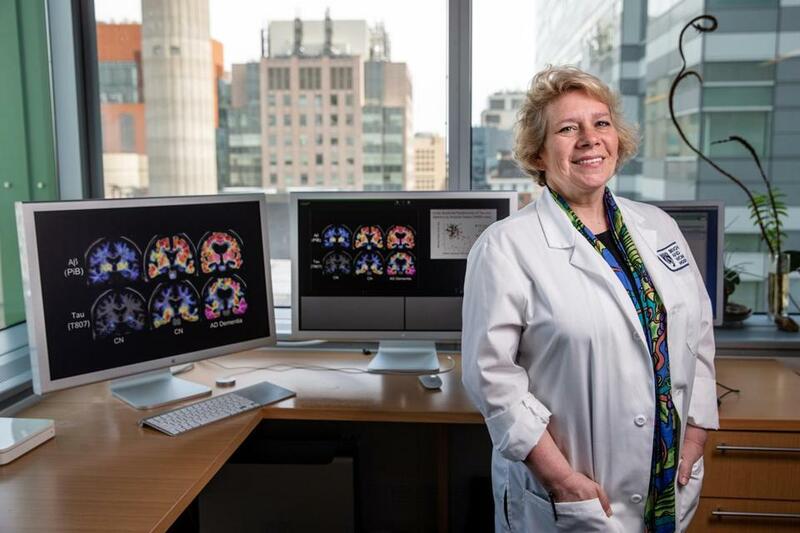 Her work on the preclinical phase over the last decade has led to a new biological definition of Alzheimer’s: one based on the buildup of amyloid plaques and tau tangles, as identified by PET scans and other biomarkers. Because these scans can cost as much as $4,000, Sperling is not suggesting that doctors start routinely testing healthy adults for Alzheimer’s. This new definition is still just for researchers, who can use it to identify appropriate patients for drug trials. In 2014, along with USC’s Aisen, Sperling started a trial called A4, which will look at the effect of sola on people who have high amounts of amyloid, but who have yet to develop any memory or behavioral problems. She refers to this approach as secondary prevention. The results of A4 are expected in 2022. Last year, Sperling also landed a NIH grant to try to catch Alzheimer’s even earlier , in people who have “just a little bit of amyloid.” This study will test the effectiveness of a BACE inhibitor, a drug that is designed to decrease the production of amyloid. Sperling regularly shares data and insights with colleagues around the world who are also trying to find out if Alzheimer’s can be stopped before it starts. These other prevention trials also focus on select groups of healthy patients who, in the absence of any intervention, are highly likely to develop Alzheimer’s. In 2011, President Obama signed the National Alzheimer’s Project Act, which aimed to develop a strategy to prevent and treat Alzheimer’s by 2025. “If any of these secondary prevention trials are successful . . . we will have a path toward prevention by then,” Sperling says. ABOUT FIVE YEARS AGO, Bill McDonough was leading a tour around Harvard Square when he suddenly forgot which dorm John Adams lived in. The memory lapse was notable, since he was then the head of Boston Private Tours, a company with about 20 employees that takes tourists to historic sites throughout New England. When he went to see a neurologist, he was diagnosed with mild cognitive impairment (MCI), which puts him at increased risk for developing Alzheimer’s. Like most people with MCI, McDonough can still live independently. But given his frequent memory lapses, he had to stop driving and passed on the reins of the company to his daughter. Lately, he often forgets the day of the week — or even the month. “This is terrifying,” he says. His doctors believe he has lost about 30 percent of his memory over the last six years. Patients with MCI often — but not always — go on to develop full-blown Alzheimer’s. In this second stage, they typically require help with basic tasks such as getting dressed. McDonough, 73, who lives in Concord, is enrolled in a clinical trial at Boston University that tests an anti-amyloid drug for patients with mild dementia. In the study, one-third of the patients get a placebo, one-third get a half-dose of the drug, and another third receive the full dose. McDonough suspects he is not getting the placebo. After accidentally taking a double dose once, he noticed that he was able to think more clearly. He acknowledges it may be too late for a cure for himself, but he’s glad he is doing something to help others. While he feels sad about the losses he has endured, he says his life right now is comfortable. He has a supportive spouse and enjoys watercolor and oil painting in an artist’s studio a couple of miles from his house. But he worries about the future. “I don’t want to be a greater burden to my wife,” he says. Recruiting patients like McDonough is challenging, according to Nicole Gullotti, a recruitment coordinator at BU. “Caregivers are often burned out, and the last thing they want to do is to take patients into Boston for extra medical visits,” she says. And the criteria for studies are often strict, meaning that only patients with a certain amount of amyloid are eligible to participate. Despite the long list of disappointments, this month, Pfizer announced that it will add about $150 million over the next few years to its venture fund to support small biotech companies engaging in research on Alzheimer’s and other neurological diseases. Whatever new drugs are discovered, Sperling insists that early intervention is key to combating the disease. By 2050, she envisions a world in which people at age 50 would take a blood test to get screened for Alzheimer’s, just as they currently get screened for colon cancer with a colonoscopy. Those who are at high risk for developing the disease could start taking medication to prevent the buildup of amyloid and tau. Sperling admits that, due to her family history of Alzheimer’s, she sometimes worries about her own future. Joshua Kendall is a Boston-based journalist who writes about health care and politics. Send comments to magazine@globe.com. Get the best of the magazine’s award-winning stories and features right in your e-mail inbox every Sunday. Sign up here.